When politicians and pundits refer to the American Dream, they do so to evoke images of national unity, identity, and a better future. But in what ways does this metaphor manifest in the actual dreams of sleeping Americans? 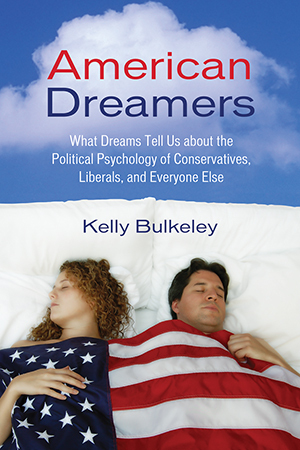 In American Dreamers, dream researcher Kelly Bulkeley takes the ideology of the American Dream one step further-into the study of sleeping dreams-to explore how the nocturnal side of human existence offers a key to the psychological origins of people’s waking beliefs and political passions. Bulkeley builds on sixteen years of scientific research involving thousands of dream reports to show how the playful fancies of our dreaming imaginations can be interpreted as insightful expressions of our hopes and fears about issues as varied as the environment, religion, family values, and the war in Iraq. Examining in particular detail the dreaming tendencies of conservatives and liberals, the book centers on ten people of different political perspectives-a dreamers’ focus group-who kept yearlong sleep and dream journals. The dreaming and waking stories of these “ordinary” Americans (among them a cancer survivor, a lesbian horse rancher, a former Catholic priest, a young waitress engaged to be married, and a soldier preparing for his third tour to Iraq) provide raw psychological material and a window into their deepest beliefs, darkest fears, and most inspiring ideals. Hyperventilating political pundits have described in lurid detail what conservatives and liberals disagree about, but rarely do they try to explain why they disagree-and that’s the real question. At a time of bitter partisan conflict and governmental paralysis, American Dreamers calls the country back to its visionary origins, arguing that dreams can serve as a royal road to the creation of new political solutions that integrate the best of conservative and liberal ideals. If we truly want to learn something new about the American Dream in people’s lives today, Bulkeley proposes we take a good close look at how well Americans are sleeping and dreaming at night. "No book about dreams could be more timely or more important than Kelly Bulkeley's American Dreamers. Whatever is important in people's waking lives is reflected in their dreams”vÆpolitics included. American conservatives report different dreams than American liberals. American Democrats report different dreams than American Republicans. Dr. Bulkeley paints his portraits of American dreamers with a palette that reflects his scholarship in both religious studies and dream science; the results are filled with insights that will delight, amuse, and infuriate his readers. American Dreamers provides insight into the country's future, insight that is available from no other (or better) source." "A beautifully written reminder of the depth of differences, and a dream of how difference might be understood. Bulkeley is on to something profound about us; we would benefit enormously if we could even just glimpse that understanding." "This story we tell ourselves in our dreams passes the impurities of our waking life through an ethical filter and exposes truths we have not yet acknowledged. American Dreamers is a comprehensive and very readable account of our unconscious adaptation of what is still a hazardous and imperfect waking domain. Bulkeley's professional life has revolved around dreams and what we can learn from them. This book is true to its title. He has opened the door to the sociology of dreams." "With an exemplary grasp of dream science built upon thousands of dream accounts, Bulkeley presents a multifaceted and nuanced portrait of the ways our deeply seated ideas, values, virtues, and fears become apparent within our dreams. This groundbreaking and timely work challenges us to develop a greater understanding of and respect for all people across the political spectrum."